Engineered hardwood flooring - the invention : After World War 2, there was a boom in home productions with concrete slabs. The high demands was due to the veterans that came home to start a family. These homes were quick to build, but came with a cost to the hardwood flooring industry. Concrete slab homes ended up hurting the hardwood flooring industry, because solid wood floors could not be installed over slabs, due to its instability - cupping, crowning, twisting and moisture damage. Linoleum, tile and carpet was dominant, during that period. The hardwood flooring industry knew it wasn't good for business, so they sought out for a solution. In the 1960's came the birth of engineered hardwood floors. Engineered hardwood floors enables homeowners to install wood flooring in areas, where solid wood floors could not be installed. Areas that have high moisture conditions, such as water fronts and basements. Although, It was specifically designed to be installed over concrete slabs. It can be used in a variety of applications: below, on or above grade installation. Even when it was invented, engineered floors was still in the shadow of solid wood floors. 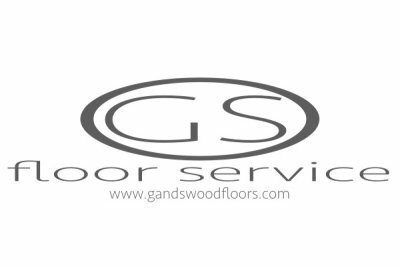 Sales of solid wood flooring outnumbered engineered flooring sales. It was a new product and still had construction issues. Construction issues like delaminating and longevity of its life span. Over the years, engineered flooring have evolved and improved in construction and performance. Making it the more sought out wood flooring product today. What is Engineered hardwood flooring? It is a wood flooring product made of several layers of thin wood glued together. 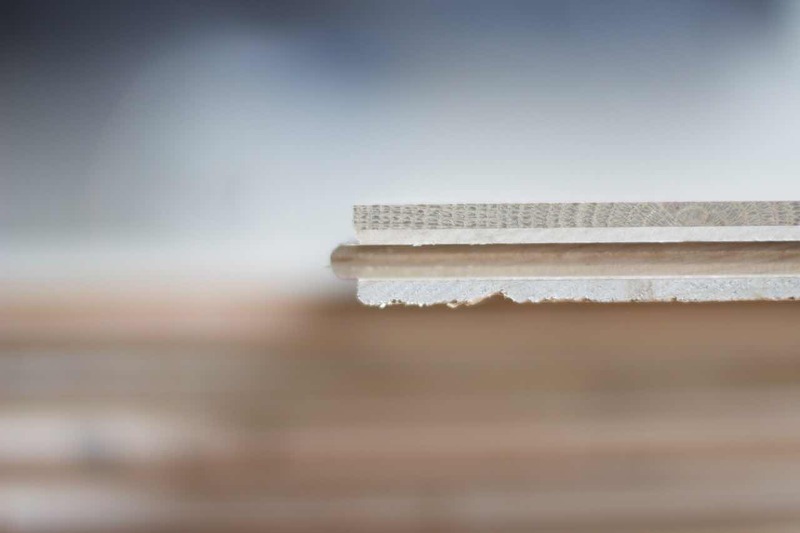 These layers are categorized into three parts: top veneer layer (also known as the wear layer), core and backing. Engineered floors are available in pre-finished and unfinished flooring. It can be nailed, glued or floated over your subfloor. Quality and cost will depend on the material and construction. Cost ranges from $3 to $14 per square feet. Top layer - real wood veneer that ranges from 2 mm to 6 mm in thickness. Hardness will depend on the specie and thickness of the veneer. 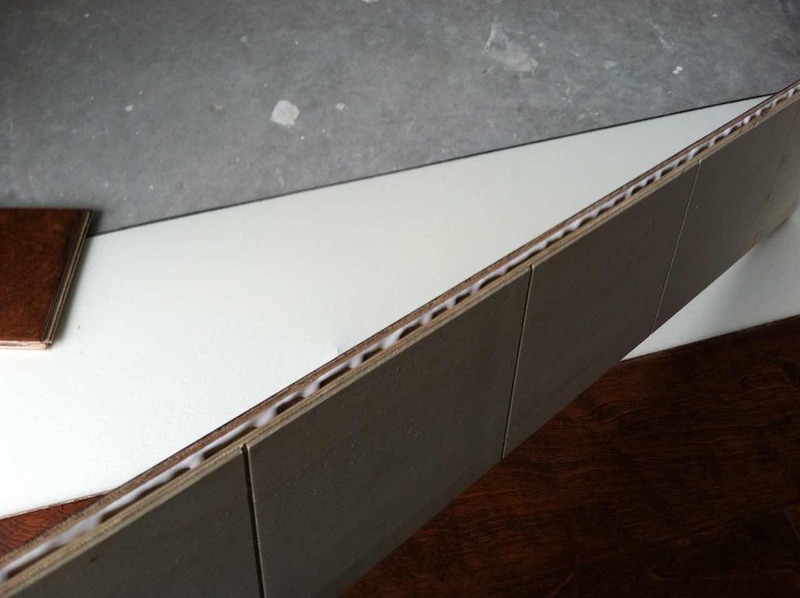 The thickness of the veneer will determine the quality of the flooring product. A thin 2mm veneer will dent easily versus a 6mm veneer. A 2mm veneer is considered a one and done flooring. The life span on a 2mm veneer is 15 to 20 years, then the flooring will need to be replaced. It cannot be refinished like a traditional solid wood flooring. Whereas a 6 mm veneer flooring life span can last up to 100 years. It allows several sanding, just like a solid wood floor. Core - softwood, high density fiber and plywood construction. The thickness of the flooring usually determines the quality of the product. A thin 1/4" or 3/8" engineered flooring, the core is usually constructed of softwood or high density. 1/2", 5/8" and 3/4" engineered flooring will have plywood construction. Plywood construction is more stable because the layers are laid 90 degrees to each other, minimizing expansion and contraction. Backing - bottom layer of the floor board. Most backing is made of softwood. This layer adds to the stability of the floor board. Some will have slots cut in, for glue traps and flexibility. Who should consider engineered hardwood flooring? Who should consider engineered hardwood floor? We know that the product can be installed anywhere, but is it worth the extra money to invest in? Here is list of who should consider installing engineered hardwood in their home. Do-it-yourselfer's - if, you like DIY. Then engineered flooring is for you. Installation is a breeze with a pre-finished click-lock system. Water front properties - If, you own a home nearby or on a waterfront. Consider an engineered floor for its stability. The flooring will be able to handle higher humidity levels. Unstable humidity levels - If, you live in an area, where the climate is too dry, too humid or just unstable. Including homes with no climate control. Wet basement - Some basements tend to stay wet. When it rains, it's wet. Moisture in the basement will cause problems above . Engineered flooring is your solution. Wide plank flooring - If, you are installing planks or wide planks. You will want to consider going with engineered flooring. The biggest complaint with wide planks is that the gaps are wide. Cut down on those gaps with engineered hardwood. You don't like gaps - You are annoyed by gaps in the floor. I am not saying, it will be gap free. Engineered flooring is still a wood product and wood will expand and contract. It just does it much less compared to solid hardwood flooring. Where to install engineered hardwood floors? With its great ability to keep its shape and size. Engineered hardwood can be installed in basements and all levels of your home and condo buildings: Below, on and above grade, even walls. It can also, be installed over radiant heat. Check with the manufacturer first to see, if, your engineered hardwood can be installed directly over radiant heat. Constant heat contact can cause the glue to soften and ply's to delaminate, if, it is not rated for radiant heat. When is the best time to install engineered hardwood flooring? 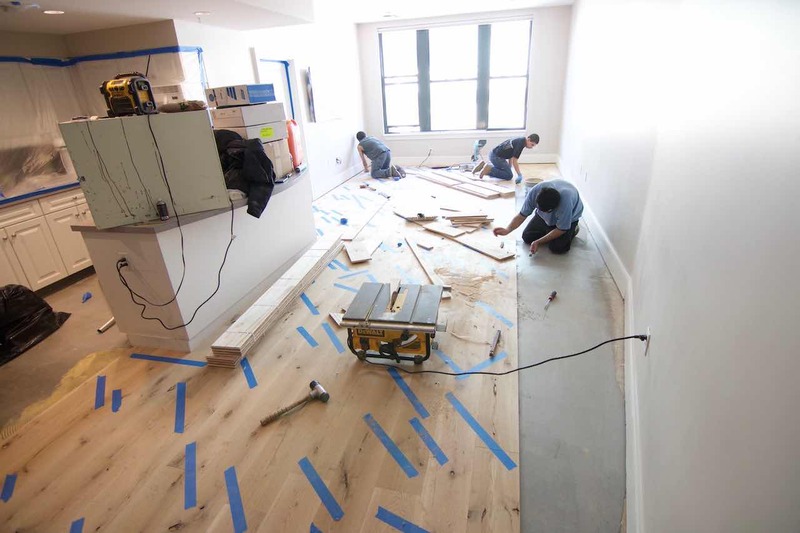 When is the best time to install engineered hardwood floors? After your home is encapsulated: roof, siding, doors, windows, insulation, board and plaster installed. The humidity level is maintained between 30-50% for normal living condition. Your HVAC system has been up and running for a minimum of 14 days. Your new concrete slab has dried over 30 days. Your wooden subfloor measures less than 12 % on a moisture meter. You have acclimated the flooring to within 2 % of your subfloor. Why install engineered hardwood flooring? Why install engineered hardwood flooring? Because of all the above information: stability, location, living conditions, installation and cost. It's a great choice for a stable floor and a great investment for your home. Engineered hardwood flooring can be installed in various methods including: nail-down, staple-down, glue and floating. You can add special underlayments for sound proofing, insulation and cushioning, depending on your requirements. Nail down - You can face nail the flooring with decorative nails. Staple down - Blind nail to hide the appearance of the fasteners. Regular and preventive maintenance of engineered flooring. You should care and maintain your engineered hardwood flooring just like you would for solid hardwood flooring. If, it is pre-finished, follow the manufacturers instruction for care and maintenance guidelines, so you do not void their warranty. Otherwise, the tips below should help you. Maintain humidty between 30-50% throughout the year. Regularly vacuum sand, dirt and debris to prevent from scratching. Use doormats at entrances and high traffic areas. Do not wash with water or leave water standing in place. Avoid wearing heels and sports cleats. Add protective felt to your furniture. Hopefully this was enough information to help you make the best decision, when choosing hardwood flooring between a solid wood and engineered hardwood flooring. If, you have any questions, drop me an email.